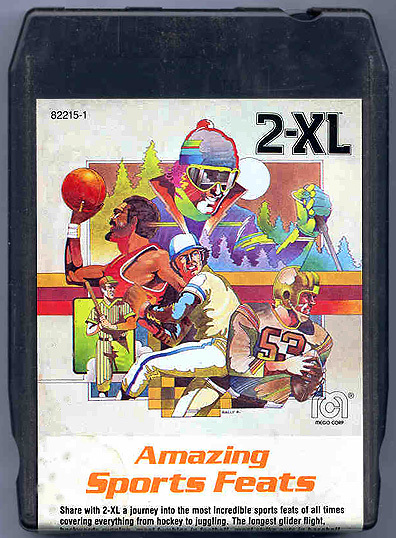 World of 2-XL: Mego 2-XL Program "Amazing Sports Feats"
Other Comments: Since both Sports and Sports 2 were 1978 programs, 1981's Amazing Sports Feats makes a nice follow-up with the more "relaxed attitude" 2-XL. In addition to straight-forward sports questions, the program also covers games and worlds records, so even people who know nothing about sports (like me) can find something to enjoy here. "VIEWDATA" is a fabulous piece of music. We never used it in any of our childhood projects because, not being sports fans, we never bought the tape at the time. Our loss. The first time I listened to it I was hit by how strongly it sounded like it was made by the same musician that made "Tomorrow's Technology" from Word and Sound Games (a piece we did use a lot). It turns out both tracks were written by George Fenton, from the KPM Music Library release KPM-1223 SMALL IS BEAUTIFUL.